This afternoon I watch the beatification of Pope John Paul on EWTN. Listening to the inspiring recount of his life and the virtues he made manifest during his pontificate. It's timely because today I search myself for those much needed virtues to continue remaining steadfast in youth ministry life. Last night, an experience that shook me again as I witnessed emotional outbursts again from the siblings I look after, turned me into the shock absorber I've always found myself to be in. We were outside at the church of St. Jerome. It was supposed to be simple issue and yet the woundedness of young hearts screamed for their voices to be hurt crying out "I'm in pain! Pay attention to me!" The screams were loud and it was everywhere. I stood there trying to stay strong and keep grounded as their pain clashed against each other and against me. Pain is terrible. And it's terrible to witness pain that has long been unresolved. 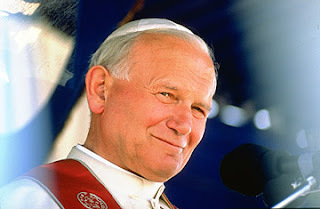 A few weeks ago, I read an article about Pope John Paul II and his commendable silence especially in moments of chaos. Something inside me was struck by this lesson that needs to be learned.